Gino Littles came from basketball parents. His dad played in the ABA and coached in the NBA. His mom was a college player. But for a long time growing up, Littles was lost in the recruiting scene that zoomed in on the bigger players. Then, as he started to grow and his basketball IQ continued to take off and his determination never more forceful, he left Scottsdale Desert Mountain High without a college offer but with a chip on his shoulder to prove he could make it. 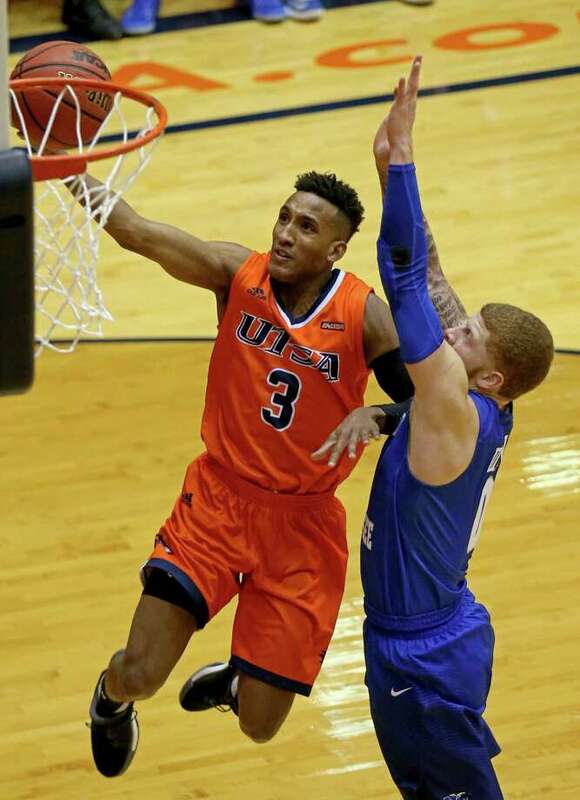 The 6-foot-1, 164-pound point guard came in as preferred walk-on at NCAA Division I Texas-San Antonio, ended up starting 22 of the 27 games in which he played, and at the end of his first season was awarded a full scholarship. "I always knew I was blessed with good quickness, and a great IQ but I owe most of my success to working hard and seeing past the obstacles and through most people who doubted me, either because I was not tall enough or too small." As players currently go through the spring AAU basketball showcases, Littles' story serves as motivation for those feeling lost in the forest of high-profile athletes. Littles proves there is hope. Littles was a skinny 5-foot, 85-pounder when he began high school. He was 5-4, 105 as a sophomore, 5-8, 125 as a junior, and 5-9, 135 as a senior. "His growth plates are wide open and will grow more, his doctor told him," said Dana Littles, Gino's mom. He transferred from Scottsdale Chaparral to Desert Mountain midway through his high school career, and he didn't become a starter until his senior year when Rolando Rhymes, a 2012-13 All-Arizona performer as a junior, left the team. "For Gino, he had a great work ethic, a high basketball IQ," said Gilbert Christian coach Kurt Keener, who only worked with Littles at Desert Mountain during his senior year. "I think it was a process of him developing physically. "He got a lot better. As he got physically bigger, he played with more confidence. I felt he was a pretty confident player by the time he left here." But for anyone to walk on at an NCAA Division I college and start in his first year is very rare. "I think it had a lot to do with understanding the game so well and getting the opportunity," Keener said. Littles played in the club circuit, always hanging onto hope, as he grew bigger and bigger. ision I colleges," Littles said. "Playing against the best of the best made me better. "I have been blessed to have had many great coaches, and being able to attend camps such as John Lucas' 40/40, because I always knew that there was always something new to learn, so I can improve my game and take it to the next level. "Not having any offers out of high school, UTSA took a chance on me when they gave me the opportunity to join their program as a preferred walk-on. The chance to be part of a D-I program was a dream come true, and inspired me to work even harder, because I knew I had the potential to play at the highest level. I just never had a chance." It was in mid-December when Littles broke into the starting lineup to be the point guard. "I knew it was a once-in-a-lifetime opportunity and I never looked back," he said. "The coaching staff gave me an opportunity that I would of never thought was possible, and I can never thank them enough for that." Littles ended up averaging 23.7 minutes and had 57 assists, 24 turnovers, 17 steals and 2.4 points a game on a 14-16 team. More important, he learned the value of patience and hard work, and he feels he will be so much better next season. "I want to finish my collegiate basketball career by helping my team win a conference championship, and to earn a bid into the big dance," he said. "I am more determined than ever to keep on looking past the obstacles, and having a great sophomore season for the Roadrunners."